1. Click your iPad under the Devices section. 2. Click the Apps tab, then scroll down to File Sharing. 3. Click VLC, then the Add button. 4. Choose the videos you want to add. Very easy, right? Okay, but what happens if you load up a video that VLC won't play? In fact, it doesn't even appear in the app--meaning you can't delete it from there. Now what? iTunes inexplicably lacks a Delete button in this File Sharing area, and right-clicking a document does no good. 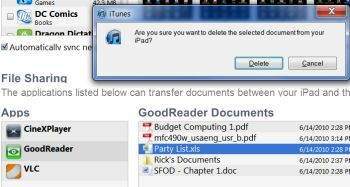 So how the heck do you delete a file you've copied to your iPad? The answer's so obvious, you'll smack your forehead when you hear it. In the Documents list, click the name of the file you want to remove, and then press the Delete key on your keyboard. iTunes will ask for confirmation, and then, presto, it's gone. Note to Apple: Hellooooo? Can we get a Delete button, please?